Herringthorpe stadium played host to the third round of the Youth Development League Upper age group (U17 &U20) athletes on Sunday. A very strong Kington upon Hull AC squad had dominated the previous two matches with Rotherham Harriers, Spenborough AC and Bingley Harriers fighting out the minor places. Grimsby Harriers have had a torrid season so far and were firmly anchored to the bottom of the league. At the outset it was clear that Kingston were set to win the match and guarantee their promotion place for next season but the competition for second place was likely to be closer as Bingley had assembled a good team and Rotherham were hampered by the absence of several key athletes who were competing in the English Schools Combined events qualifying event at Doncaster's Keepmoat stadium; severely weakening the U20 Women's team. As most teams find it difficult to field athletes in this age group it was no surprise that there were no competitors in the U20W track events from 800m to 3000m and very few competitors in any age group in the specialist Hurdles, High Jump and Triple Jump events. Leo Rowley (U17M) was not one to let the low key atmosphere get to him and he was in great form as he produced a terrific throw of 16.24m in the Shot Putt to improve his pb by 50cm and cement his third place in the UK rankings for this event. He was also on form in the Discus with his second best ever throw of 40.30m, an event in which he is also ranked in the UK top 30. A second place in the Hammer completed a great afternoon for the Harrier's throwing event star.. In the U20 M Devon Stead was a winner in the 2000m s/c as he once more recorded a time below seven minutes even though he had to run his own race as he lapped the opposition runners. Ryan Beale was another easy winner in the 3000m A race and Ollie Potter was a winner in the 800m B. Other results Ryan Beale 800m A 2nd, Javelin A 2nd; Alex Andrews 100m A 3rd, 200m A 3rd; Daniel Bradford 1500m A 3rd, Shot B 3rd; Joe Massingham Shot A 2nd; James Johnson L J A 3rd; Alex Kitson L J B 2nd. In the U20W Amber O'Malley was a winner in the Hammer B event. Other results Elizabeth Coupe Hammer A 3rd, Discus B 2nd, Shot B 2nd, Javelin B 2nd; Amber O'Malley Javelin A 2nd, Discus A 3rd, Shot A 3rd. 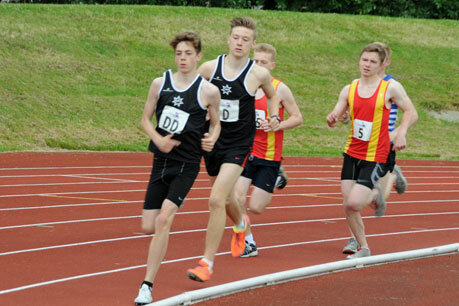 Kane Smith was in excellent form for the U17M on the track as he recorded impressive performances in wining the middle distance double of 800m and 1500m, Joe Massingham and Declan Walker-Smith made it a home double in both races with victories in the 800m B and 1500m B races respectively. Bradley Ellison was a winner in the 100m B. Other results Derius Greenaway 100m A 2nd, 200m A 2nd; James Johnson 3000m A 2nd; Bradley Ellison 200m B 2nd, L J 2nd; Kane Smith Jav 2nd; Joe Massingham 400m B 3rd; Alex Kitson 400m A 4th. The U17W 4 x 100m squad were winners; other results Sophie Oak 100m A 2nd, 200m A 2nd; Georgia Bradford 800m A 2nd, 100m B 3rd, Shot 3rd; Sophie Kebell 300m A 2nd, 200m B 2nd; Darcey Joseph Jav 2nd, Discus 2nd, L J 4th; Louise Oak 300m B 2nd, Hammer 3rd. The final match result 1st Kingston AC 509pts, 2nd Bingley Harriers 397pts, 3rd Rotherham Harriers 325 pts, 4th Spenborough AC 237 pts, 5th Grimsby Harriers 31 pts. 1st Kinston u Hull AC 15pts, 2nd Rotherham HAC 11pts, 3rd Bingley 9pts, 4th Spenborough AC 7 pts, 5th Grimsby Harriers 3 pts.